Revolving house can be rotated in desired direction by operating with a switch. It is found in Australia. For getting light, we switch on the bulb. But by switching on, this house rotates towards the Sun. 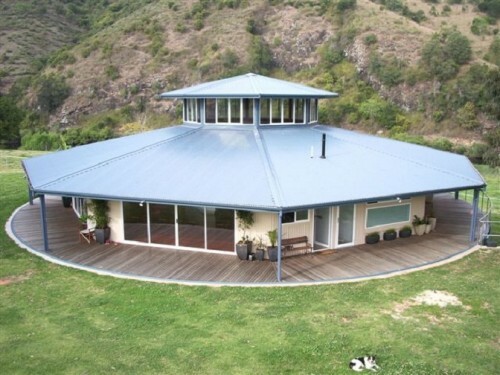 This revolving house is in New South Wales in Australia. House lies in pleasant atmosphere and environment. There is green lawn on grass on one side of the house. On the other side, there are wooden benches. At some distance, there are hills covered with beautiful bushes and plants. Also there is a river flowing near to the house. A man named Everingham had once observed the remodeling of a house beside his house. Then he got a sudden idea to build a revolving house. Then he started research on it. He researched on all rotating objects like fan, wheel in motor etc. He did extensive research and experiments for it. He wandered many towns and cities for research. Somehow finally he got succeeded. He achieved the desired result after the extensive research of ten years. Everingham arranged an iron track in circular shape with strong foundation. He constructed house on another circular bearing track. 36 small iron wheels similar to the wheels of the train are attached to the bottom circular iron track such that both the upper portion and lower portion are in some alignment. Engineering construction required to move the house was made below the house only. But switch panel exists in living room. In switch board, there is an option with 8 directions. House can be rotated in desired direction. If we got bored of seeing the same scenery through the window, then we can rotate the house to see anther scenery through the same window. While watching television, if sunlight falls on it, then we could change the angle of the house. To enjoy pleasant environment around the house, a big wooden bench was arranged. But it is not movable. One can sit there and enjoy the beautiful environment. Two power driven devices similar to the size of washing machine are used to generate the required power for rotating the house. Revolving house can be rotated to 360 degrees in any direction. If it rotates slowly, then it takes 2 hours to complete one revolution. At high speed, it takes 30 minutes for a complete revolution. If it rotates with more than that speed, not only the things in the house but also the human beings also will fall down. House has one hall, three bed rooms. Total there are eight rooms. All the walls of the house are made of steel and glass only. It took just 3.2 crores of rupees to build this house.